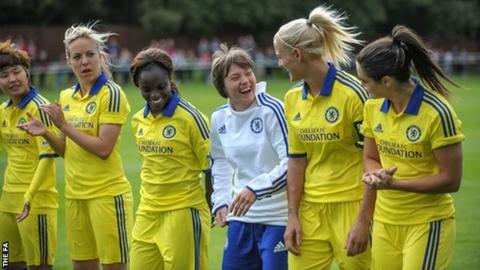 Chelsea Ladies say they are not worried about the injury preventing Fran Kirby from making her debut for the club. The forward signed from Reading during the mid-season break for a reported British women's record transfer fee but is yet to play for her new team. Assistant manager Paul Green told BBC Sport that 22-year-old Kirby had sustained a "niggle" while playing for England at the World Cup. He would not specify the nature of the problem but said it was "not serious". Green said: "She's just got a slight little niggle that we've got to be careful with, but we're not in a rush for her to come into the team." Kirby missed Chelsea's first match back after the international break against Bristol Academy and was an unused substitute against Sunderland on Saturday. Green said it was a "little bit to soon" to say when Kirby would return. He added: "We're hoping for next week but we'll have to wait and see how this week goes in training and check with our physio again." Kirby scored England's first goal at the World Cup and played in four matches at the tournament in Canada, but did not feature after their last-16 victory over Norway. Green says Chelsea were aware of Kirby's injury when they signed her but that the club were not worried by it. "We did a full medical and it's nothing serious," he added. "It's just a little niggle, which she will get over hopefully in the next week or two."